I slept really well and was up early as usual updating my notes. Outside I could hear the sound of heavy rainfall but rain or no rain, my plan today was to continue on and complete Shiromineji (#81), Negoroji (#82) and Ichinomiyaji (#83). I put on the TV to watch the weather forecast and it reported there would be thunder showers during the morning and early afternoon with the graphics showing things clearing up later in the afternoon. I finally got myself up around 8 o'clock and started packing up. When I looked outside, the rain was still coming down very hard and my only real worry was that the mountain paths would be muddy and slippery. Other than that, getting a little wet occasionally was just a part of the ohenro experience. When I finally left at 09:15 the heavy rain had eased up and there was just a bit of a light drizzle and parts of the sky looked like it was actually starting to clear up. I headed back towards Kokubunji (#80) and then picked up the arrows for the trail leading up to Shiromineji (#81). As I headed along the road leading to the start of the mountain trail a car passed me with the number plate 88-88. The exact same number plate I had seen on a Ferrari and Porsche in Tokyo the day I had gone to buy my bus ticket to Tokushima. The car turned right up ahead and I had hoped it had stopped so I could photograph the plate. When I got near the driver and passenger were getting out and I asked if I could photograph the number plate. I told them I had seen the same plate on a Ferrari and Porsche back in Tokyo. I took it to be a lucky sign and after a quick photograph I thanked the driver, gave him a photograph and continued on my way. 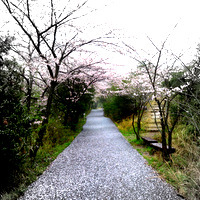 Just before I joined the mountain path I was greeted by the sight of a whole stretch of road completely covered in a thick layer cherry blossom petals. It was literally like a carpet of cherry blossom had been laid out for me. I stopped to take a photograph and to avoid slipping, carefully continued on before joining the mountain trail. The mountain trail was not as muddy as I had feared but it was a lot steeper than I remembered. It had stopped raining but it was still very misty. A little further I had to take cover under a tree to avoid a sudden downpour which stopped just as quickly as it had started. At the first rest hut I stopped to enjoy the view. and listen to the sounds. The only sound was the sound of flowing water and bird song. It really was great despite the threat of more heavy showers. I cleared the first stretch of mountain trail and joined up with the road that lead all the way to Shiromineji (#81) and decided to stick to the road for a while. From the road I could see the tree covered sides of the mountain much more clearly with the different types of cherry blossom trees adding contrast and colour. Had it been nice and sunny the colour contrast would have been sharper but the misty overcast conditions created for a very different but equally interesting visual display. After my slight detour along the road I rejoined the mountain trail and was soon nearing Shiromineji (#81). Shiromineji (#81) contained a lot of different buildings, the main hall and daishi hall were both at the very top. I slowly made my way up the long steps having to hold on to the hand rail to haul myself up. A week or so earlier I had a feeling that I had been bitten by something because the area around my left thigh sometimes felt numb. More seriously, sometimes my left leg seemed to lack both the strength and general co-ordination with the rest of my body. It did just that as I was heading up and I almost lost my balance when a couple of women walking down the other side caught me by surprise with a sudden greeting. Thankfully I made it to the top and after going through my prayer rituals, I took some photographs and headed back down. It would have been nice to have spent more time at the temple but with things muddy, slippery and my left leg acting a little strange I decided to head to the stamp office and continue on towards Negoroji (#82). Maybe be because of the weather the temple was not so busy and the man in the stamp office seemed underwhelmed with work and quite busy on his smartphone. I greeted him and without really looking up he put his smartphone aside, took my stamp book and put in the stamp, took the money and then resumed what he was doing on his smartphone. The serious expression on his face suggested he was probably focused on setting a new personal record for Candy Crush or some other such game. I had seen equally serious expressions on the faces of regular Candy Crush addicts riding the trains into work in Tokyo. Before leaving I interrupted him once more to hand him a photograph. He thanked me and then quickly resumed his previous position. I exited the temple and got myself an energy drink from the nearby vending machines then returned back along the trail I had taken to get to the temple. In places the trail was surprisingly slippery because of the wet ground and progress was a little slower than it would have been otherwise. 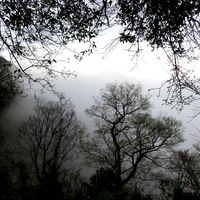 The rains were holding off but the mist would sometimes suddenly sweep in and create a strangely unnerving kind of an atmosphere. I met just a single pilgrim who was heading towards Shiromineji (#81) and no other signs of life except for the constant birdsong which I actually quite liked. I had seen signs at Shiromineji (#81) warning of wild boars so I had was making sure the bells were putting out sufficient sound to hopefully scare the living daylights out them. I came across a rather large hoof like imprint in the mud and that would have been enough to scare the living daylights out of me during the first pilgrimage but I had still not see a single wild boar. I'd seen one that had been chopped in half length ways Damien Hirst style and mounted on a wall outside a restaurant that served wild boar on the menu. I'd also seen some regular looking pigs at Kokumin Shukusha Tosa but other than that I had not had the pleasure of meeting them. It seemed the poor wild boars were the ones who were scared of humans and only attacked if suddenly surprised. I knew the boars were around and not wanting to put my surprise attack theory to the test I continued on my way clanging my bells as I went. After a while I came off the mountain trail and joined the road with an overhead sign showing that I was 2km from Negoroji (#82). As I joined the road section it started to rain and up ahead I could see a small shrine and a building with a large outline of a walking pilgrim painted on the side. I figured it could be a rest stop for pilgrims but when I tried to slide open the glass doors on the front it appeared locked. I went around to the side and tried the door and thankfully the door was open because as soon as I stepped inside there was another torrential downpour. It lasted all of 5 minutes but had I been out in the open I would have got drenched. As it was, inside the well appointed hut I found some snacks and cans of tea and coffee. I ate some of the snacks and drank a coffee. It looked like a meeting sort of room but I could see osamefuda on the walls so I assumed it was OK to help myself to a snack and a can of coffee. I pinned a photograph to a wall along side other photographs of people engaged in various shrine/temple related activities. I thanked my lucky stars that I had been saved from the sudden shower and then continued on my way. A little further on I spotted a large hut which would have been quite a good place to camp had I made my way up yesterday. A little further on was a small restaurant and shop with vending machines outside. I stopped to buy some Pocky. Pocky had been a regular treat when I was living in Kagawa and were just thin biscuit like sticks covered in chocolate. On a different sort of day maybe the Pocky would have transported me back to those carefree days when I was still in my early 20s but today I just needed the Pocky for a little added energy. I left the road and rejoined a muddy trail leading to the temple. Before I got to the temple I came to a clearing with a fantastic fully enclosed hut. It was carpeted inside and the welcome mat instructed anyone entering to "Please remove your shoes." I popped my head inside but decided to take a closer look after I finished at Negoroji (#82). I would be retracing my steps before heading back down towards Ichinomiyaji (#83). I closed the door and hurried to the temple, managing to slip and fall on the very last step of the muddy trail before I got to the main gate. I bowed and then descended carefully down some rocky uneven steps and then continued on towards a couple of flights of ascending steps. There was a large group ahead of me going to the temple and a solitary figure coming down the steps on the other side. It was only when I got closer that I suddenly realized that it was Nobu-san. I had last seen Nobu-san on my way back from Kongofukuji (#38). Compared to the Nobu-san I had first met on the way to Shosanji (#12) he now looked really fit and healthy. We chatted only briefly and when I asked where he was going to stay he mentioned Sakaide. We were presently in Takamatsu and I had just come from Sakaide so I couldn't quite understand why he was going back to Sakaide until he explained that he had taken a bus up to Negoroji (#82). He was going to return to Sakaide and then visit Kokubunji (#80) tomorrow and then Ichinomiyaji (#84). He seemed to be a hurry so I didn't ask any more questions but just wished him well. Whatever he was doing, it was good to see him again and it was great to see him looking so fit and well. I climbed up the second flight of steps and saw the daishi hall to my right and the stamp office a little further on my left. Up a further flight of steps was the main hall. I set my pack down near the stamp office and was getting my bits and pieces together before heading to the main hall when one of the old men in the stamp office gestured as if I was there to get my book stamped. I was planning to get it stamped after I prayed but there seemed no harm in getting it done before so I handed it over and he shakily but very nicely put the stamp in. When he returned the book I passed the photographs to him and asked him to pick one he liked. In the end they both selected ones they liked and with that done I headed to the main hall. Rather than a direct path to the front of the main hall I followed an inner corridor around the outer courtyard. It was lined with hundreds small jizo statues and continued all the way to the front of the main hall. I prayed, took a few photographs and then continued back round the other side and then on towards the daishi hall. I waited for a large group to finish and then went through my own prayer routine. With everything done at Negoroji (#82) I now just wanted to check out the new ohenro hut and then try and make it to Ichinomiya (#83) in time to get my stamp. Back at the ohenro hut I removed my muddy boots and went inside. It was a hexagonal shaped hut and although it didn't appear big from the outside it felt surprisingly spacious inside. A small staircase along one side led up to a narrow landing around at least half the ceiling space. There seemed to be enough space for 2 people to easily put down their sleeping mats and sleeping bags. Whether it was possible to actually stay at the hut I wasn't sure but it certainly looked like a potentially great place to stop. There was a port-a-loo just beside the hut even though a few minutes up the trail was a much larger purpose built toilet block in the temple car park. It would probably be a wonderfully peaceful spot to be late in the evening. The hut actually reminded me of the really nice hut just before Dainichiji (#13) but not as well appointed. It did however have a basket full of very nice snacks. Plus an incredibly tasty cold herbal tea in a small barrel shaped container. I ate a couple of snacks and had several small cups of the tea before I left. I also pinned a photograph to the wall and then got myself ready to head on down. I now had two and a half hours to cover the 11km or so in order to get to Ichinoyamaji (#83) in time to get my stamp. I got back to the road and then took a sharp left and headed down towards Takamatsu City. I was reasonably confident that I could get to Ichinoyamaji (#83) in time to get my stamp but but my left leg decided to have one of it's moments again so after a quick pause I pushed on as best as I could. I then came to a spot where the trail markers indicated going down a seriously steep muddy slippery looking wooded trail or continuing along the longer twisting road section. Time was at a premium now so I gingerly took a few steps down and found myself stuck because I was sure the next move would send me slithering all the way to the bottom. I steadied myself as best I could using my staff, managed to get my pack off and used it as an anchor to stop myself from literally sliding all the way down. Muddy pack aside I made it safely down the slippery short cut and saved myself a few valuable minutes. I then continued on as quickly as I could taking care to avoid slipping up on the wet cherry blossom that covered the bends in the road. A little further down I recognised where I was because I was actually passing the turn for the 'omoide zakura' cherry blossom tree that I had been driven to yesterday. Another look would have been great but time didn't seem to be on my side today. When I finally got down from the descending part I decided to call ahead to the zenkonyado where I was hoping to stay at. The zenkonyado was 3km past Ichinoyamaji (#83) and even if I missed getting my stamp I could always return in the morning before heading on to Yashimaji (#84). I had tried phoning from the ohenro hut but there had been no phone reception back there but this time I got through and the news was not good. I wasn't sure if he said it was full or if today was a holiday but either way I was not going to be staying at the zenkonyado I had stayed at last time. I was not too worry because there were plenty of places to stay in central Takamatsu plus I had another potential place I had been told about when I was back in Kochi. It was not a well known place but I had been told to mention the name of the person who had given me these details. I called and got through to a woman and gave her the name of the person who had told me about the zenkonyado and asked if I could stay. She said I could and so I asked if she could tell me where the place was. The poor woman was doing her best to explain where the zenkonyado was located but I couldn't figure it out so I told her I would get someone to call her a little later and told her not to worry. I now at least had a place where I could stay and problem of discovering exactly where it was could wait until later. I looked at my watch and did a quick calculation of the distance remaining and came to the conclusion that as long as my left leg to co-operated there was a very good chance that things could still work out. There were 2 trails marked in my guide book towards Ichinoyamaji (#83) once I reached a certain point. One trail crossed over a small bridge and zig-zagged all the way to the temple while the other took a more direct right-angled approached. I had been advised to follow the right-angled approach by the person who had given me the information about the zenkonyado. During my first pilgrimage I had taken the zig-zag route but the small bridge across the river was partly missing and partly under water so that immediately ruled out the zig-zag route that I knew. I decided on the seemingly more direct route and it appeared easy enough, go straight down the river and turn left. However, things don't always go well when your mind was not really 100% on what you're supposed to be doing. I was concentrating on getting to Ichinomiyamaji (#83) in time to get my stamp and not on the more crucial part, namely how I get there. I realized something was not quite right because I was supposed to be next to the river and the river had vanished. In the bigger scheme of things I wasn't really lost, I just didn't know precisely where I was. The arrows had deserted me too so I stopped to ask a local woman who told me to go straight ahead and ask someone again. I went straight ahead and came to a large intersection with signs for 3 different routes one of which I couldn't find in my guide book. Just when I thought all hope was lost my map reading skills kicked into overdrive and I knew exactly where I was. The only problem however was a space time disequilibrium. My hope now was that a bus load of pilgrims, possibly even two double decker bus loads of pilgrims, with stamp books, scrolls and white jackets had all descended on the temple and were at this very moment keeping the stamp office busy beyond it's usual closing time. As I hurried on as fast as my right leg would carry me, I saw a sign which said 300m to Ichinoyamaji (#83). I looked at my watch and it said 16:59. There had to be hope and if I made it, it would be the fastest one legged 300m sprint to a stamp office in recorded ohenro history. It was 17:03 when I arrived, 3 minutes past the hour that stamp offices were usually open until. However, rather a bus load of pilgrims saving me, it had to be divine intervention that had saved me because I found the shutters to the stamp office open and a lady patiently waiting for someone to turn up, possibly me. I asked her if it was still OK to get a stamp and she said yes. I handed her my stamp book as I quietly thanked my lucky stars for a second time. With the stamp done I now no longer needed to make a return trip in the morning but I still needed to know the exact place where I was hoping to stay this evening. I asked the lady if she could do me a favour and call the number I had been given and ask for some detailed instructions about the precise location. She happily obliged and after a lot of very polite exchanges with someone that sounded like a man this time she tried her best to explain where it was. It turned out be just where the man back in Kochi had marked it in my guide book. The only distraction was that the convenience store nearby was actually not very nearby. Anyway I now knew the general location where it was and I could always call again when I got closer. I asked the woman to choose a photograph and then someone who I assumed was her husband turned up in the stamp office and I asked him to choose one too. I gave the woman another photoograph just for being so kind to me and after repeated thanks I went of to pray at the two halls. With prayers done, I took a few photographs, got my second energy drink of the day and with everything done I picked up my pack from near the stamp office, thanked the woman once more and then headed for the main gate and on towards the general location of the zenkonyado. On the way I came across a 7 Eleven and not having had my daily fix of coffee and dorayaki I was in there like a shot. I enjoyed my coffee break and connected to the free wifi to check for any messages. The only important point of note was that Das who I had met at the very first temple had completed her journey. She had posted a great little video of her journey which was a daily one second video compilation for each of her 43 days around Shikoku. I left a short message congratulating her and wishing her well and with that done I headed back out and continued on my way. I had not gone very far when a large 4x4 passed me slowly and pulled up ahead on the other side of the road. A man got out and crossed over to my side of the road and I had an inkling it was the man from the zenkonyado on a search and rescue mission for me. Before he had a chance to ask if I was the person who had called earlier, I asked him if he was Mr So And So. He said he was and I apologized for having dragged him out like this. He offered to drive me to the zenkonyado but I told him I would walk. He then offered to take my pack but I said I would carry it. I showed him my map book and he pointed out where the zenkonyado was. I thanked him and then continued on as fast as I could. The instructions were cross the bridge and turn right. I crossed the bridge and forgot to turn right so back it was to the bridge and then right turn. Then finally a little further on I came to what looked like the place I was looking for. I asked a neighbour who was standing outside her own home if the place was Mr So And So's Zenkonyado and she said yes. Just at that moment, Mr So And So turned up next to the zenkonyado followed by Mrs So And So who had been on look out duty for me. I thanked the neighbour and apologized to my hosts for the trouble I had caused them. The zenkonyado turned out to be really nice and the old lady in particular was incredibly sweet. After probably worrying that I would struggle to understand her, I surprised even myself by managing to understand much of what she was saying. She was speaking in the stronger local dialect and even when I didn't know what she was saying everything seemed perfectly understandable and I felt very much at home. I had been in my rain gear all day dragging my pack up and down mountains and then rushing to get to Ichinoyamaji (#83) so my immediate priority was to shower. The old lady explained everything to me, the shower, the toilet, how to use the washing machine, where to hang everything, tea bags, hot water, the book where I could write a message, the album into which I could place my osamefuda, the newspaper clippings and so on. I looked through the message book and discovered that only a small handful of non-Japanese pilgrims had stayed at the place since it first opened a little over a year earlier. She showed me various newspaper clippings with photographs of her and her husband standing out in front. I was pilgrim number 80 and she had already entered a date for me in the message book and asked me to write something before I left. She showed me the other English messages, one was from a Spanish man, another from a German woman and finally one from 2 British men who were the last English speakers to stay. There had been one or two Korean visitors too. This evening I was the only person scheduled to stay there and she had already made out a space for me to sleep. I had forgotten my immediate priority about getting showered and any thoughts I had that I might be smoldering like a rotten fish were forgotten too because I decided to show her my photographs. I told her she could take as many as she liked and she ended up with several, mostly of flowers plus the only one I had of myself from my first pilgrimage. With everything done, she left me alone and returned to her home which was right next door. I showered, changed into fresh clothes, got the washing machine going and then headed out to find a convenience store. Before I even got near a convenience store I spotted a sign for a Marunaka supermarket and headed towards that instead. I bought some food and something to drink and then slowly headed back. When I got back to the zenkonyado the old lady was coming out and in her hand she had a piece of paper on which she had drawn a map to help me locate the nearest convenience store. I told her I had just returned from the supermarket and she seemed happy that I found it and got something to eat. She joined me inside again and we ended up chatting about various things. I told her I had been the English teacher in the prefecture 24 years ago and that tomorrow I hoped to briefly meet the parents of one of my students. She was surprisingly easy to chat with and after we got talking about the pilgrimage, she took out her own stamp books and told me she and her husband had completed the pilgrimage several times. Her stamp books had multiple stamps on each page and flicking through I stopped to see what her Daihōji (#44) stamp looked like. Compared to the one in her book, mine really was truly unique if nothing else. I showed her the extra stamps I had picked up, especially the one from Aizen-in on the very first day of my pilgrimage. It had been done using a very different style of brush and like me, she also really liked it very much when she saw it.﻿ It would have been nice if I had turned up a little earlier and had more chance to talk to her but it was getting late so she politely excused herself and told me she would return the following morning with onigiri and miso soup for me. I thanked her again for hosting me and with that she was gone. I ate my bento, had some tea and then got ready to get into my comfortable looking futon and start updating my notes. It had been a very full day and it had all ended great just like every other day on the pilgrimage so far. Even when it looked like things would not work out and I was sure myself that they would not work out today, everything had still worked out perfectly fine. 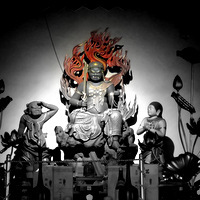 I now had only five more temples left to visit before I headed out of Kagawa and back to Ryozenji (#1) in Tokushima. Today had been the start of the seventh week and with Ryozenji (#1) beckoning it felt like it was just yesterday that I had started my pilgrimage. As I finished updating my notes and lay back to get some sleep, I was again reminded of the ohenro spirit. It was a priceless commodity that seemed to find it's expression in the kindness of those who looked after and looked out for walking pilgrims like me.